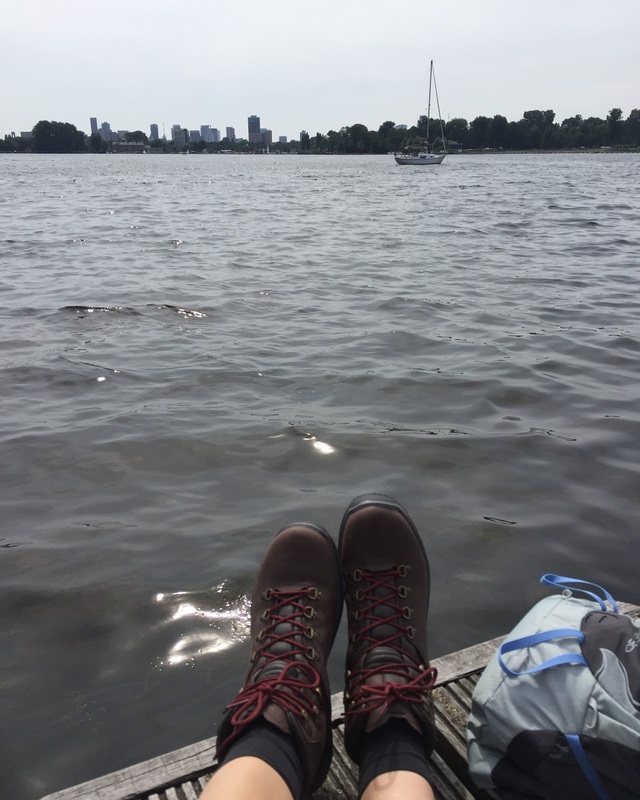 Monday I wrote that I went for a hike on Sunday in my city Rotterdam. It takes a bike ride of approx 30 minutes to get me there, but it's so worth it. The 'Kralingse plas' beats every park in the neighborhood and offers a great escape of the hustle and bustle of the city. Families come here on weekends to BBQ, to sunbathe or for a swim. Couples come here for a hand in hand stroll with the baby or dog. And lots of people come here to enjoy some kind of exercise as well. In the beginning of the park it's so crowded, but the farther you walk, the quieter it gets. Even on the most sunny Sundays. Here I snapped some pictures of my favorite few of the skyline of Rotterdam. More pictures can be seen in this blog post. Most of the time that I come here, I come for a run around the lake or to relax in the sun. But this time I truly came to hike and to walk in my new shoes and try out my new Osprey backpack. It's so calming to walk around here. Can't believe all this nature (and it's not even the woods yet!) is still part of Rotterdam. My new shoes! Biked a total of an hour and walked for around 1,5 hours. It was quite the workout in this warmth! Great way to train for my coming trip to Morocco and to climb Mount Toubkal! !